After hazelnut picking at Garside’s Fruit Farm I had a bag of Italian plums that needed to be used. The reason the owner gave me the plums was because they were extremely ripe, and had to be used immediately. I knew I wanted to make a German plum cake with them when I got them, however wasn’t sure on what recipe to use. In the past I had tried a few different recipes, however have never been fully satisfied with the results. The yeast based ones I found too doughy, while my Mom’s breadcrumb recipe I find a little too subtle. 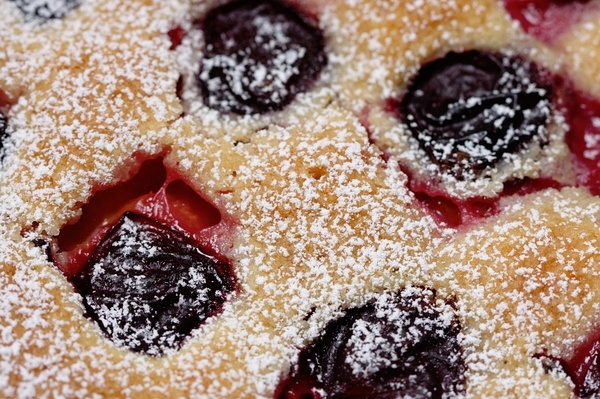 After a short time looking on Google I found a plum cake recipe that looked to be a what I was looking for in a plum cake. I modified the recipe slightly, but essentially followed it along. Preheat the oven to 325 degrees. Place a piece of parchment paper (or grease) on a 9×13 baking pan. In a large bowl mix baking powder, salt and flour. With an electric mixer cream the sugar and butter until butter is pale and the sugar is fully mixed in. Add the egg, vanilla and milk to the butter mixture and mix until fully combined. Slowly add the flour mixture 1/3 at a time to the mixture, until the wet and dry ingredients are fully mixed. Pour the batter into the baking pan, and spread evenly with a spatula. Next place the plums skin side up in rows. Press them down slightly into the batter as you go. Bake for about 1 hour or until the cake passes the toothpick test. Let cool before eating. Before serving sprinkle the confectionery sugar over the cake with a sift. If you do this too soon before you serve the cake the sugar will get absorbed into the cake. 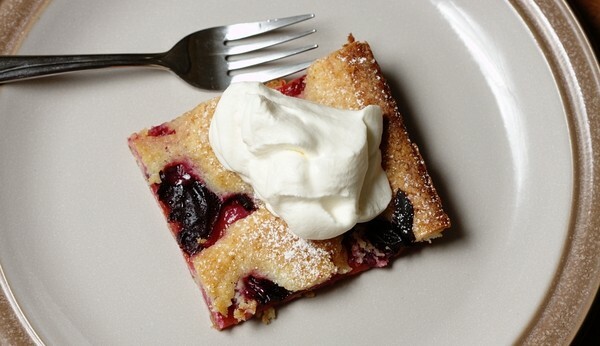 Lastly do yourself a favor and make up some whipping cream (Schlagsahne) to put on this cake. That is it, pretty simple recipe, but absolutely delicious. 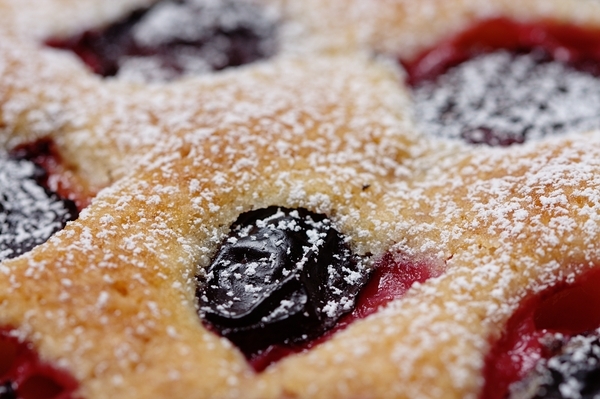 I am really happy to have found this recipe, as it will be my new goto for making plum cakes. 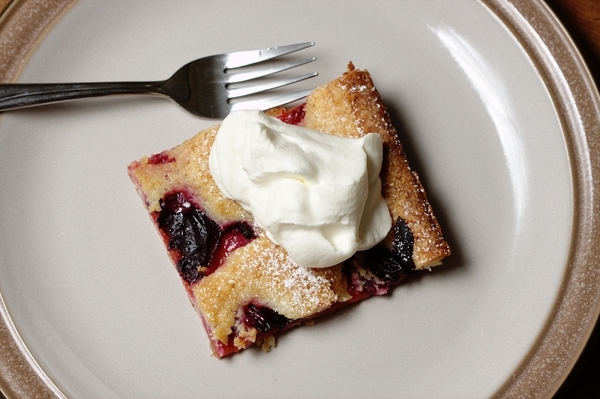 What I love about this cake is how the flavors of the plum seep into the crust. I might try this recipe using other fruits as well, such as blackberries or raspberries. We live in AZ and love it here, but we very seldom see Italian plums. Today I spotted some and now wanted a recipe. I know if Germany we always used a yeast dough, but I wanted something simpler.. This recipe sounds good and I look forward to baking it. I wonder, can the whole cup of sugar be reduced or augmented by artificial sugar ? Will the results still be good? Maybe it does not have to be that sweet, especially since I will serve it with whipped cream anyhow. Renate I don’t think there would be any problem cutting the sugar down, especially if you are going to be putting whipping cream on it. You may run into consistency problems, but it is worth a try. 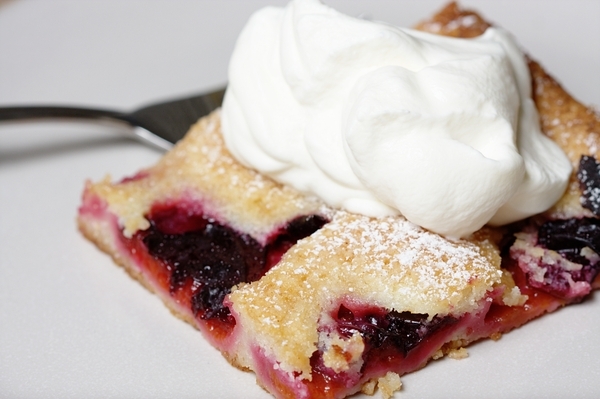 So happy to find your recipe, my great-grandmother and my mother made pflaumenkuhen very similar to this, the Italian plums are here now and I have two cakes in the oven as I write this! I cant wait to taste this plum cake, my kitchen smells so good! Cheer’s to you! Thank you! My mother in law made a wonderful plum cake. I tried to make it by using her recipe but it didn’t come out right at all. I was so happy to find this non- yeast recipe. Will definitely give it a try.